Soraa, the world leader in GaN on GaN™ LED technology, announced today that it has added to its full visible spectrum LED product portfolio a PAR20 lamp with incredibly high CBCP, flawless beam definition and edges, and outstanding color and whiteness rendering. Ideal for both commercial and residential applications, the PAR20 features the company’s POINT SOURCE OPTICS™ and Violet-Emission 3-Phosphor (VP₃) COLOR™ and VP₃ WHITE™ technologies—providing a superior replacement for 75W to 90W legacy products. Soraa’s POINT SOURCE OPTICS technology enables the offering of the industry’s only 10-degree narrow spot version of a PAR20 LED lamp while delivering a Center Beam Candle Power (CBCP) almost double that of its nearest competitor. The optics seamlessly produce beautiful, high intensity and uniform beams and are available in four beam angles including 10, 25, 36 and 60 degrees. 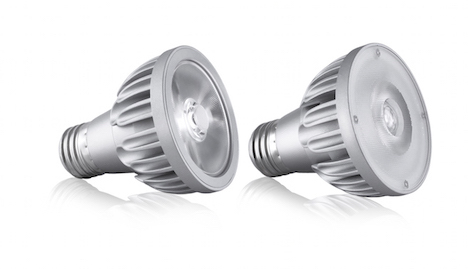 With a color-rendering index (CRI) of 95 and deep red (R9) rendering of 95, the 10.8W PAR20 not only crushes its halogen counterparts, but easily outperforms its LED competition as well. The company’s Violet-Emission 3-Phosphor (VP₃) LED technology allows for perfect rendering of colors and whiteness. Utilizing every color in the rainbow, especially deep red emission, Soraa’s VP₃ VIVID COLOR renders warm tones beautifully and accurately. And unlike blue-based white LEDs without any violet/ultra-violet emission, the company’s VP₃ NATURAL WHITE is achieved by engineering the violet emission to properly excite fluorescing brightening agents including natural objects like human eyes and teeth, as well as manufactured white materials such as clothing, paper and cosmetics. Soraa’s PAR20 LED lamps are offered in 75W (Soraa VIVID) and 90W (Soraa BRILLIANT) equivalents, and a 50W replacement option will also soon be available. The lamps are available in four color temperatures ranging from very warm white to cool (2700K, 3000K, 4000K and 5000K), and Soraa is the only lamp manufacturer that guarantees lamp-to-lamp color consistency to be within a 3-Step MacAdam Ellipse for its PAR20 products. The PAR20 Series is compatible with enclosed fixtures and suitable for damp operating environments. Additionally, all of Soraa’s PAR20 10 degree LED lamps are designed to work with the company’s award-winning magnetic accessory SNAP system. With a simple magnetic accessory attachment, beam shapes can be altered and color temperature can be modified, allowing endless design and display possibilities. For more information on Soraa’s PAR20 LED lamp, as well as the company’s full line of MR16, PAR30, PAR38 and AR111 LED lamps, as well as Soraa’s Optical Light Engines, please visit: www.soraa.com. Or see them for yourself in Soraa’s booth (#757) at LIGHTFAIR International, May 5-7 at the Javits Center in New York, NY.